Meat stock is made by cooking pieces of meat that have a joint in them – such as a whole chicken cut up or a beef or lamb shank. This stock is milder in flavour than bone broth. However, both meat stocks and bone broths are healing foods. Gelatine found in the joints and knuckles of bones, is one of the most effective superfoods for healing a leaky gut. It protects and heals the mucosal lining of the digestive tract and helps to regenerate cells. 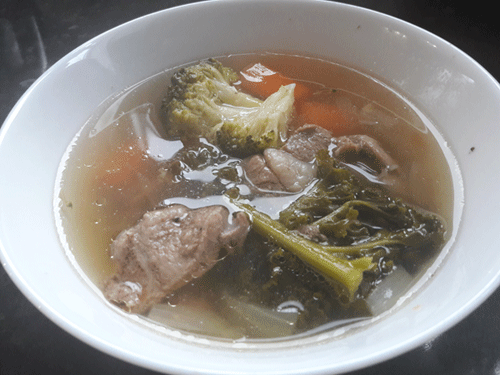 This is our recipe for organic lamb stock (soup). It can be used as both a stock (to make other soups) or consumed as a soup itself. Put the lamb in a stock pot and fill with 2 litres of filtered water. Add ingredients above except broccoli and kale. Bring the stock to a boil on a medium heat, removing any scum that may appear on the top. Let it boil for 5 minutes, then turn it on a low heat with the lid on, and let it simmer for 3 - 4 hours. 15 minutes before you turn the soup off, add the broccoli and kale.